Geek Grotto - Get Your Geek On! : SABAGEBU! - SURVIVAL GAME CLUB! Licesensed! SABAGEBU! - SURVIVAL GAME CLUB! Licesensed! 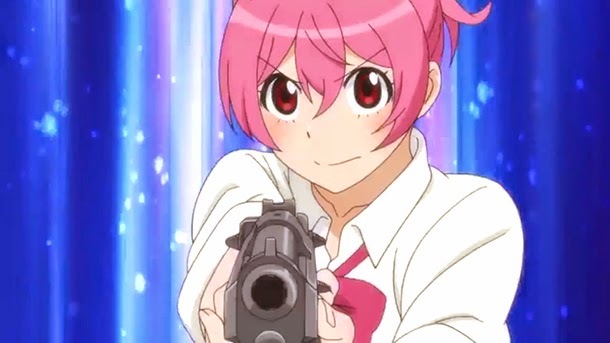 HOUSTON, July 5, 2014 – Surviving your first day at a new school is tough, but dodging bullets from the barrels of pistol packing, gun crazy girls will be even tougher in Sentai Filmworks' latest acquisition, Sabagebu! - Survival Game Club! -. This action comedy series is directed by Masahiko Ohta (Yuruyuri – Happy go Lily, Love Lab) with series composition by Takashi Aoshima (Kotoura-san, Minami-ke), character design by Masashi Kudo (Maoyu, Samurai Flamenco) and animation production by Pierrot Plus (Tegami Bachi: Letter Bee, Beelzebub). Life can be hard… especially when it’s your first day at a new school. Will people like you? What do you wear? It’s all up in the air and expectations are high to make the right choices. Above all, you certainly don’t want it to be boring and monotonous. And that’s exactly where we find transfer student, Momoka Sonokawa. To make matters worse, she gets harassed on the train on her way to school. So, imagine Momoka’s delight when a dashing senior from Aogiri High unexpectedly saves her from the throes of a creepy old man. Her hero has brains, brawn and a Beretta! This, at least, makes the sting of being forced to join the school’s Survival Game Club all the more easy when her hero fatefully turns out to be Miou Ootori, its President! What might sound senseless, impractical, and a little insane compared to the “normal clubs” also sounds like an exhilarating romp as these babes with bullets learn rappelling and paramilitary training in what could be called Survival of the Misses! Prep yourselves as Momoka Sonokawa must learn the beauty of battle from a bevy of beauties as action and shoujo collide as the girls of Aogiri High School come out with guns blazing in Sabagebu! - Survival Game Club -! Sabagebu!- Survival Game Club! - will be available soon through select digital outlets with a home video release to follow.